China, the world’s largest carbon polluter, also is becoming an even bigger player in the solar energy business as it expands its control of the solar equipment manufacturing worldwide. A unit of China National Chemical Corp. announced in November 2014 a plan to buy Norway-based REC Solar for $640 million. The deal will complement its business, Elkem, which is also based in Norway and produces silicon for making solar cells and computer chips. REC Solar has bought silicon from Elkem for making solar panels, and its chairman, Ole Enger, used to be CEO of Elkem. Elkem also is part of a large business within China National Chemical that counts U.S. private equity firm Blackstone Group as a shareholder. REC Solar was spun off Renewable Energy Corp. (REC) last year and became an acquisition target. The company survived a big downturn that saw dozens of solar panel makers going out of business or getting scooped up cheaply in recent years. During that time, overproduction of solar panels led to plummeting prices and trade cases in the U.S. and Europe against Chinese manufacturers, who built giant factories and undercut its competitors. 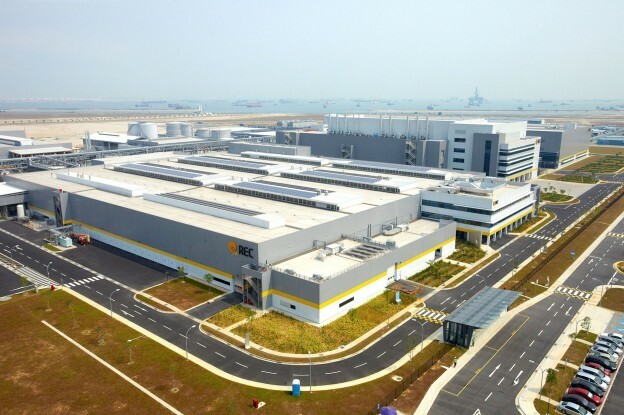 REC Solar opened a $1.8 billion factory in Singapore in 2010, right before signs of oversupply problem began to show up as losses in major solar panel makers’ earnings reports. While Chinese manufacturers, from those who make the components to the final assembly of solar panels, have to raise their prices or pay tariffs as a result of the trade cases, most of the major players have remained in business. Their own domestic market is booming thanks for government subsidies to promote solar energy generation. China’s recently announced plan to increase renewable energy use and cap carbon emissions by 2030 spells more opportunities for its solar manufacturers, many of which also have branched into developing and building solar power plants. Chinese companies already make up eight of the top 10 solar panel makers worldwide. In recent years, Chinese companies that made their fortunes in non-solar business began to invest in solar manufacturing and project development not just within China but also abroad. Hanergy bought two Silicon Valley thin film solar panel makers, MiaSole and Alta Devices, and German thin film producer, Solibro. A 2013 report by the World Resources Institute showed that China has boosted its overseas investment in solar and wind manufacturing, sales and electricity generation since 2005, with about $10 billion in 16 wind projects and $27.5 billion for 38 in solar. Countries that benefited from the investments included the United States, Spain, Italy, South Africa and Bulgaria. The investments aren’t just flowing out of China, of course. As a large solar market, it’s attracting manufacturers and project developers outside of its borders. Missouri-based SunEdison recently lined up a Chinese private equity firm, JIC Capital, for developing and building 1 gigawatt of solar power projects across China. SunPower in California announced its second joint venture in China last month for developing 3 gigawatts of solar power projects using SunPower’s SPWR +1.24% equipment. But there’s no question that China’s influence in solar and renewable energy generation overall is growing across the globe. The latest acquisition of REC Solar, one of the remaining European solar manufacturers of note, exemplifies that. A REC Solar press release said Elkem’s “ambition is to establish a leading integrated PV player” though the acquisition, but it’s unclear whether that ambition includes branching into making other equipment for running a solar power project or into developing power projects. Before announcing its sale, REC Solar was working on adding another 300 megawatts of production capacity to its 1 gigawatt operation. That plan remains unchanged, said Arndt Lutz, senior vice president of North America and Caribbean at REC Solar. “The sale doesn’t affect ongoing manufacturing plans. The current expansion of our Singapore factory is not in any way in jeopardy,” Lutz said.There would be no change to the contract that the company signed with SolarCity SCTY +0.62% earlier this year, Lutz said. The deal calls for SolarCity to buy 220 megawatts of solar panels from REC Solar during a 12-month period starting in the fourth quarter this year. The sale requires the approval of shareholders, who are scheduled to vote on Jan. 16. REC expects to close the sale by April next year.